When I first came across this recipe, I wondered how on earth the flavors of blueberry and corn would go together. To my delight, they are a perfect combination! I love how easy this skillet bread is to make. Serve with lots of softened butter. Preheat oven to 350F. Melt 2 Tbsp of the butter in an 8 inch skillet. In a large bowl, combine dry ingredients. Add blueberries. In a smaller bowl, combine the wet ingredients, including the remaining 2 Tbsp melted butter. Pour into pan and bake at 350F for 25-35 minutes or until toothpick inserted in center comes out clean. Nothing says summer like corn! Take advantage of the season and check out these additional corn recipes from fellow Sunday Supper bloggers! Ummm…this looks delicious! Would love a slice right now, although, I should really be sleeping! This looks quite tasty! I would never have thought of blueberries and corn either. I will have to try this soon! What a GREAT!!! combination. Blueberries and cornbread sounds and looks AWESOME!!! this is a must try. Became a NEW follower. come by and visit anytime. 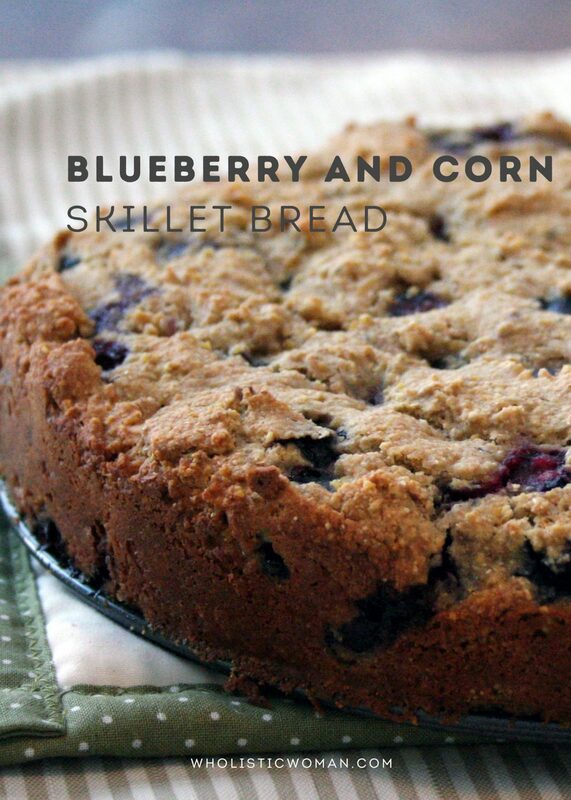 This Blueberry and Corn Skillet Bread looks so good. I would like to invite you to bring a dish to my Full Plate Thursday. Thank you for sharing and you have a great week! I would want to serve this with a smear of maple syrup butter. Yum, thanks for sharing. What an interesting combo, but I bet it is delish! That looks really good! What kind of pan did you use? I want one! It came out so pretty! I was so excited that you brought your wonderful Blueberry and Corn Skillet Bread to Full Plate Thursday. I can’t wait to get some on my plate and taste it. Thank you so much for coming and please come back! Umm that looks good! I just need a glass of milk to go with it. This is a winner – I can tell by just looking at the photo!!!! The perfect breakfast! Oh what a beauty! I know this bread wouldn’t last long in my house.